Cleve West’s gold medal-winning “M&G” garden is another that just fills me with joy and blows me away with its skill. The second I opened an image of it from the lovely House and Garden photographer, Claire Takacs (who had a sneak preview to the preview on Sunday! ), I was hooked. I loved it within the space of a nanosecond; I’m sure before my eyes had really swept from left to right across the screen. Does this make you sigh out loud, too? The really, really world-class designers get it so right you don’t really have to process any thoughts. You just fall in love from the off. And I’ve realised over the space of this week that good design supersedes all preferences I have for any particular style of garden. It’s like I can feel the skill in my bones and that excites me more than any other factor. Great design is restful and satisfying, almost a relief to set eyes on: it’s so harmonious and balanced and ‘right’. You just feel happy and content to be encapsulated by it. As if your brain can slow down and not have to try, because there is nothing jarring, nothing shouting at you, nothing that you want to get up and move, nothing that just doesn’t feel quite right. And Cleve’s garden is another that you can stare at for hours (days?, months?) and still keep finding new sparks of joy. It’s human nature for our eyes to be drawn to the ‘odd-thing-out’ but when everything is ‘in’, you just see the whole picture. Beautiful, yet subtle, fitting details come to you when you least expect it; you can’t believe you hadn’t notice them before. And this is another garden where I, amazingly, loved the hardscaping at least as much as the planting. I’m quite transfixed by this stone wall, for example. Just look at it. It is absolute genius. A perfect example of harmonious contrast: interest without dominance. The old stone work sits up against newly manufactured pavers, but this tension is released through Cleve’s unifying, contemporary arrangement of stones within the wall. Enough uniformity in the width of the smaller rocks to bring cohesion with the pavers, but enough variation in colour and irregularly of the larger blocks to excite. I can’t imagine how he came up with this, let alone how he found just the right pieces and then, ultimately, constructed it with a rock necessitating machinery to move it, perched perfectly horizontally upon a weak, sloping platform of perfectly sized stones. The brain boggles. My second favourite aspect of the hard landscaping was the fence. I hate fences. Can’t bear to see a single centimetre of them. Even the silhouette of my fence in Sydney, entirely clothed by the very vigorous Boston ivy, offended me. I just don’t want to know there is a fence there. This photo shows just how perfect the oak fencing is in this garden; I think it’s the first fence I’ve ever seen that adds rather than detracts and it took me three visits to the garden to even notice it existed! The funny thing about Cleve’s fence, is that I didn’t even see it the first time I viewed the garden. And yet it is pretty much exposed the whole way around its two sides of the garden; in fact directly in front of you wherever you stand. How can I possibly not have seen it? Again, designer-genius. He chose an oak timber, the same as all seven trees on his site; a relaxed, natural pattern; subtle colourings; and a perfectly proportioned height. It feels part of the garden, not an add on and shows how possible it is to create something that feels expansive and evokes all the right emotions, in a very small space. If I had a pound for every time I’d heard people say that you need a large area to create a meadow effect, I’d be a very rich lady. But here, in front of my eyes was the living proof. The likes of Cleve West, Andy Sturgeon and Dan Pearson have their designs oohed and aahed at non-stop, and yet I wonder if they feel quite isolated in their work. Most of us don’t really understand the half of what’s behind their designs and I wonder if we can we truly appreciate them, if we don’t truly understand them? And so again, bizarrely, we come secondly, to the planting. There are two keys features that I adore here. Firstly, as with the hard landscaping, it’s that combination of the new with the old. The craggy, leggy blueberry bushes and wind-swept, gnarly oak trees sit alongside the fresh, delicate, perfectly-formed spring growth of perennials and grasses. Such a delightful combination, each the better for their opposite. Cleve made a video of the design process for the garden, showing him walking through Exmoor National Park – the playground of his youth which inspired his design – where he talks of his ability to now ‘read’ the landscape in a way that he couldn’t as a child. To pick out the defining features, distill the natural processes and patterns and to translate and magnify them into what we think of as a garden. It’s a really fine balance to be able to keep the essence of the wild, whilst producing something that decisively feels like a true garden. Which leads us to the second feature of the planting that I loved; the combining of plants in a naturalistic fashion. It really does look like it’s been growing here for years. ‘Plant communities’ and ‘landscape naturalism’ are almost becoming clichéd expressions, but Cleve’s garden explains why we are so in love with these ideas. He has chosen plants that mingle perfectly together, just as they do in the wild, and planted them using the patterns of nature. We inherently know it looks right, that it looks natural, but few of us can replicate the subtleties and details of nature in anything like this way. I do wish I could surround myself with this level of skill and beauty every day; I genuinely believe it affects your quality of, and outlook in, life. But for now I’ll just continue to wallow in the elation that the Chelsea Flower Show has brought me this year and try my best to learn, learn, learn, as much as I possibly can, from these inspiring, almost superhuman, creators. i love, love love this Janna! I want it in fact – I could also see it with Australian natives, they would go so well in this garden too. BUT if I could have it as is, I would leap at it. I agree with your comment “The really, really world-class designers get it so right you don’t really have to process any thoughts. You just fall in love from the off”. It, to me, is like reading a book – I know a book is good if I am not analysing the writing and I am just caught up in the reading. Hope Tell has a spare 250k (UK Pounds) which is about what the big designers spend. The interesting thing is, most of the plants Cleve used are ‘exotic’ to the UK. (I’ve put it in inverted commas as exotic usually refers to tropical, here.) It just goes to show that you can create a really natural scene by using a wide range of plants, rather than being fixated on natives. It would be such a dream for me to create an Australian version of this but it was always so, so hard for me to convince clients to go for an Australian look (regardless of where the plants actually came from) and I sadly ‘inherited’ two gardens that were full of Camellia and Magnolia and totally un-Australian things. There’s nothing for it; I’m going to have to come back again soon! Wow Janna – what a thorough and beautifully written (and photographed) piece – I feel like I’ve been there now. The stone work is incredible – I love the way the larger slabs are shaped and lie in such a way that they almost look like blankets draped over the smaller stones. It hurts my brain thinking about how Cleve conceived and executed it? 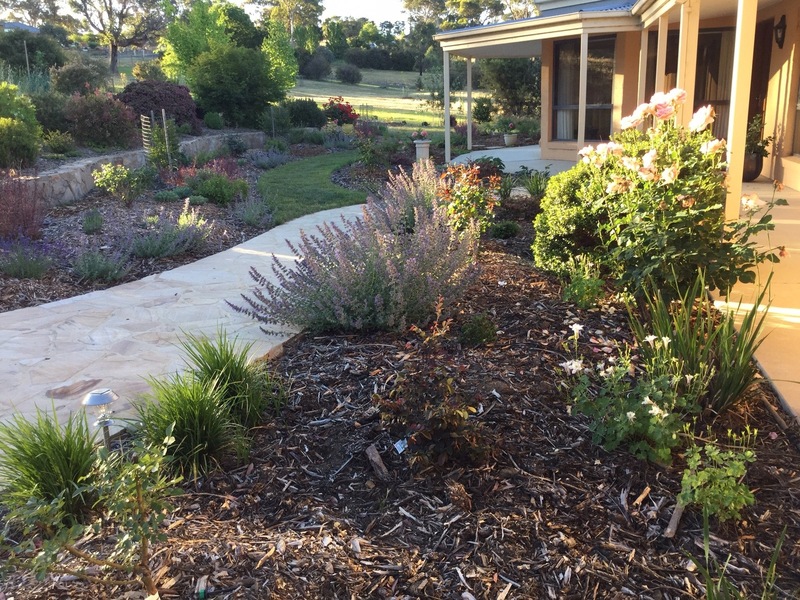 And the planting is gorgeous – so diverse but harmonious (when I looked at Cleve’s website there are more than 70 species). It’s got me googling plant names that I’m not familiar with (a favourite pastime just quietly…). Thank goodness for photographs – these gardens are nearly impossible to absorb in one hit, it’s so easy to miss the layer upon layer of detail. The new website theme looks great by the way too – keep up the great work! Gosh, Kate. I think I’m blushing! Thank you so much for you extremely kind and generous words; you’ve made my day! I adore your description of ‘draped blankets’; that’s so spot on. Sometimes I feel ‘inspiration’ is all a bit forced, i.e. designers think it sounds good to work in as many links as possible but it’s all a bit contrived. However, the draped blanket idea proves how inspiration can work fantastically. I don’t know if Cleve thought of it as a blanket, but perhaps that is why it looks so wonderful; the fact that it does mirror the form of something we see every day. You’ve clearly got a wonderful eye for this stuff! Beautiful, just beautiful! This is my favourite……I love the planting in particular, I’d also love a fence like that or no fence at all. I love the meadow effect, the colours and plant selection to me are perfect. You know Janna I will try and create this type of effect in my garden……..I do have some of those plants. Makes me want to start again! I do love what I have created so far but the more I read and the more you blog, the better understanding and appreciation I am getting about what I really love. Naturalistic planting and well placed hard surfaces that meld into the overall garden design look truly spectacular. Thank you for allowing me to experience this beautiful garden just as you did with the Dan Pearson garden. I’m amazed how much of the emotional experience you can feel, Louise, just through a set of photographs. You are so in tune with plants and nature. In my experience, you never get beyond a 60% complete picture of ‘what you really love’ in a garden…your thoughts just keep evolving forever, no matter how much you immerse yourself in trying to understand them (goodness knows, I have tried!). I think the key is to not aim for perfection in our own gardens; it’s an impossible target. Instead, we should just plant what makes us happy at the time and gradually tweak it, add new loves and remove less satisfying ones and just enjoy the journey. Remember that Cleve’s garden is at its peak for six days; but our gardens need to please us 365 days a year, year after year. 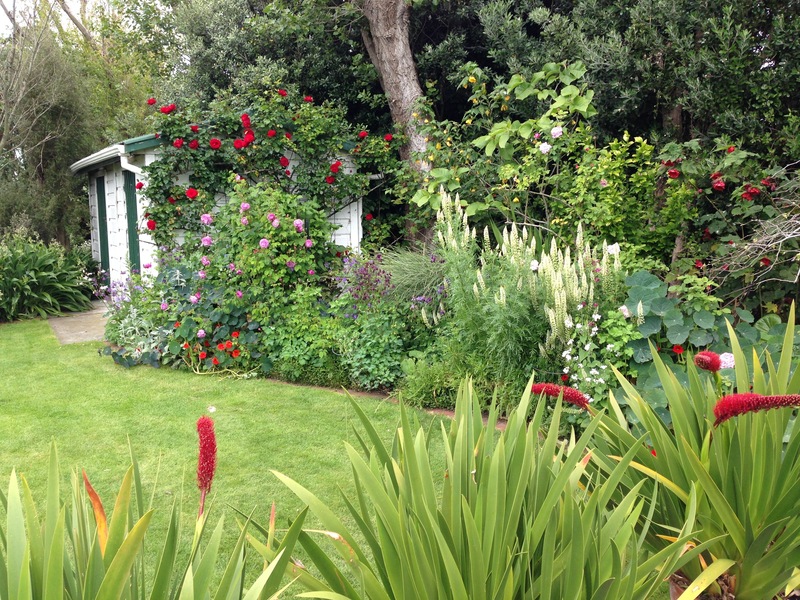 It’s wonderful to feel inspired and energised and to get new ideas but don’t forget that Cleve’s own home garden looks nothing like this, either!